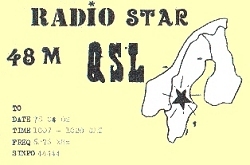 Star began in November the 27’th ,1977, on 6276 kHz. The transmitter was most truly placed somewhere in the middle of Sweden. From there seven first broadcasts, 60 reports was received. The two operators behind Star was only 15 years old, and they had build there own transmitter. The output was 40 watts. The reason why they began, was to quote them: “We thought it would be fun to broadcast and see how far the signal went”. The transmitter cost 400 SEK (in 1977 that was quite much). There was also some criticism against Star. Some editors asked if they was running lack of records. (By the repertory to be judged by) EL 34. The studio-equipment consisted of a tape-recorder! Just one, and when pressing record, it was possible to speak to the audience!